Date of marriage from Kent Pusser. Name Pryor from Kent Pusser. 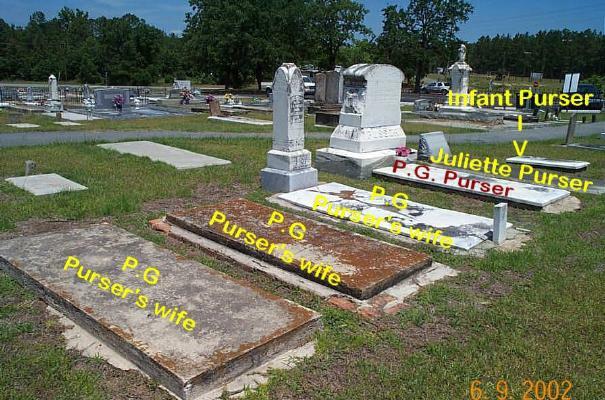 Note* 2001� Information on the children of Juliette Holland Purser was given by La Verne Floyd Dykes. She says that there were lots of girls (there were 11 according to Kent Pusser) but she cannot remember the names. She thinks there is one still alive in Griffin Georgia whom they call "Lady". Called Vera E. by Kent Pusser. [S60] 1910 Census;, Cannot make out birth year, but he is youngest. Laverne Piatt and the PIATT FAMILY NEWSLETTER; and Ruth Schooley. and Ruth Schooley via an e-mail.